Notre Dame High School is located on the southern periphery of the town of Greenock in Inverclyde. Replacing a previous school building on the same site, this denominational school project occupies a prominent position on a tight, gently sloping area of land between a main road to the north and a railway embankment to the south. 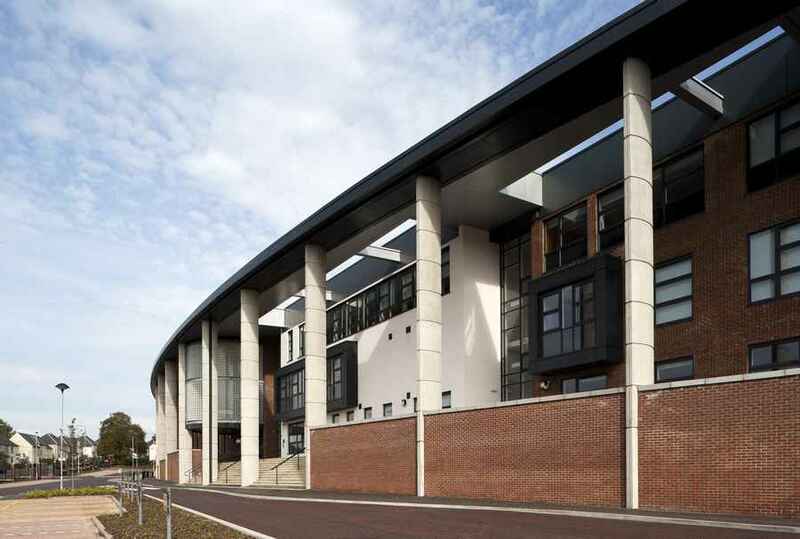 The brief was to provide a new building which matched or indeed exceeded the civic quality of the older building which it replaced and, most importantly, provided a genuinely stimulating place of learning reflective of the ethos and importance of this denominational building to the community which it serves. The form of the building is arranged to allow pupils to flow into the heart of the plan from both the east and the west via external courtyard play spaces. 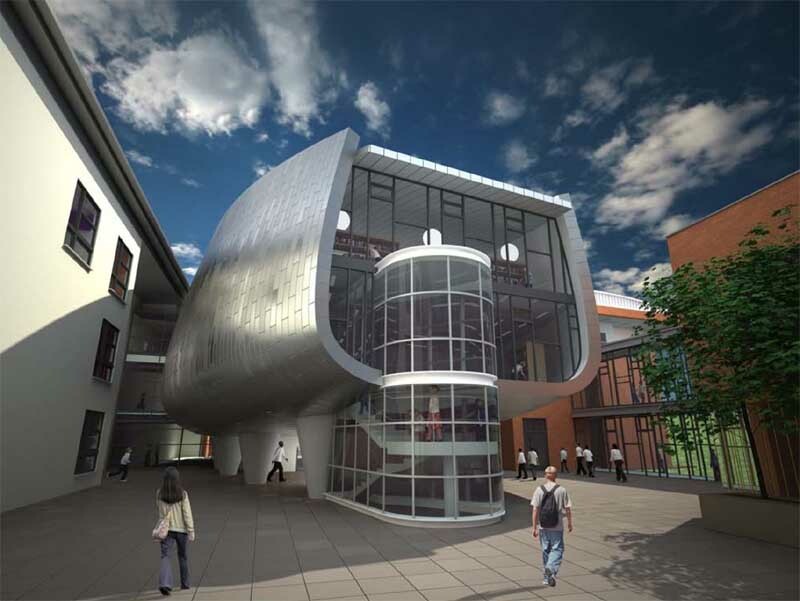 This approach allows efficient movement of pupils and a powerful connection between inside and out, both visually and functionally, an arrangement which is enhanced by the use of monumental devices such as the boat shaped, zinc clad library and the three storey vertical white plane occupying the full height of the social space. 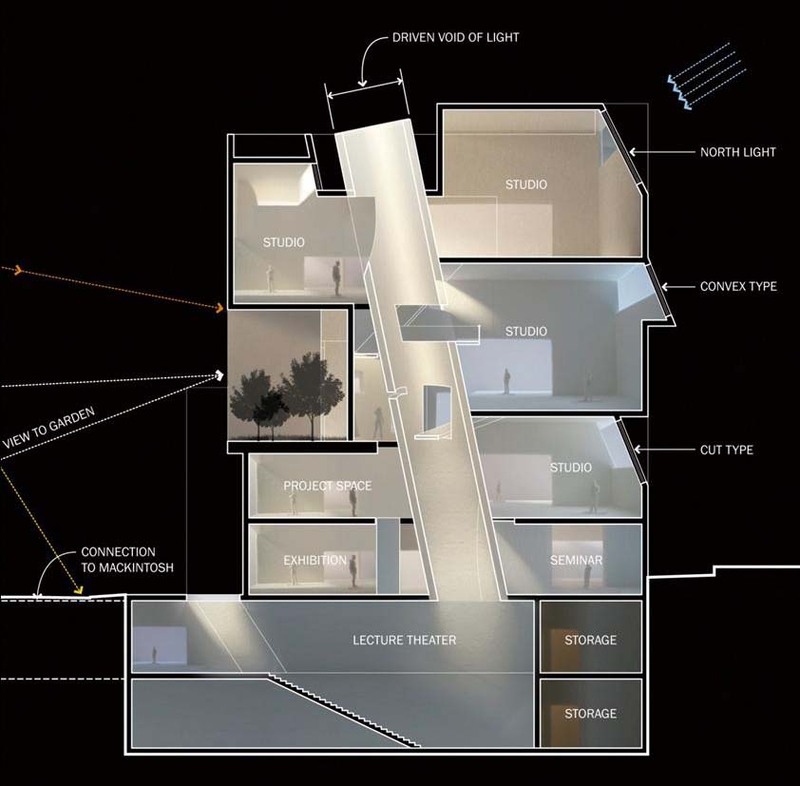 The projecting balconies and floor plates employed here, responding to the inflections of the plan and to how people move around the building, are all elements which we hope add further interest to an already visually powerful space. It is also interesting to note that up-take of school meals has increased by 54% since the opening of the new school, which the head teacher Grant McGovern believes is primarily as a result of this new social area. The quality of light and space, the building’s richness of form and the diversity of the materials employed in its construction, have all been achieved through a tightly controlled process with the contractor as the client, and all for a challenging all-in budget of £1980/m2. 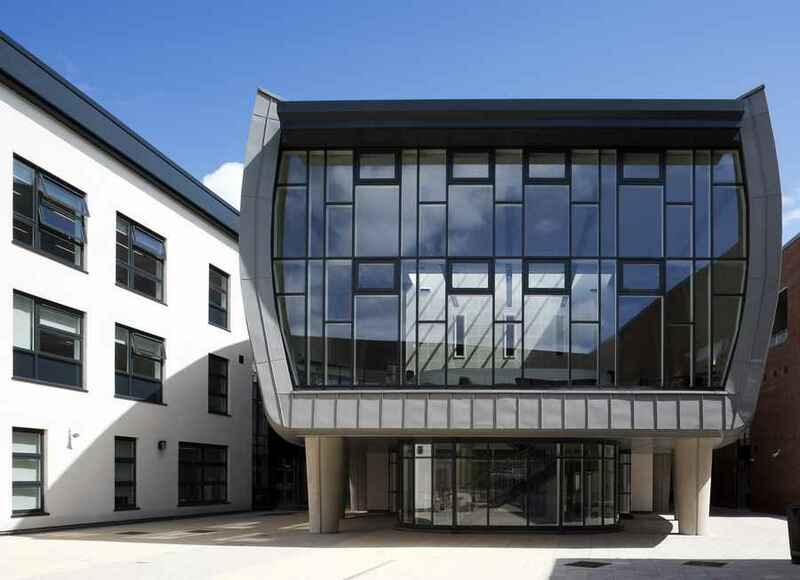 The design team and Inverclyde Council hope and believe that Notre Dame demonstrates a genuinely stimulating educational environment, one which is expressly designed to enhance the personal experience of all those who use it, whether they are pupils, teachers, or members of the wider community. 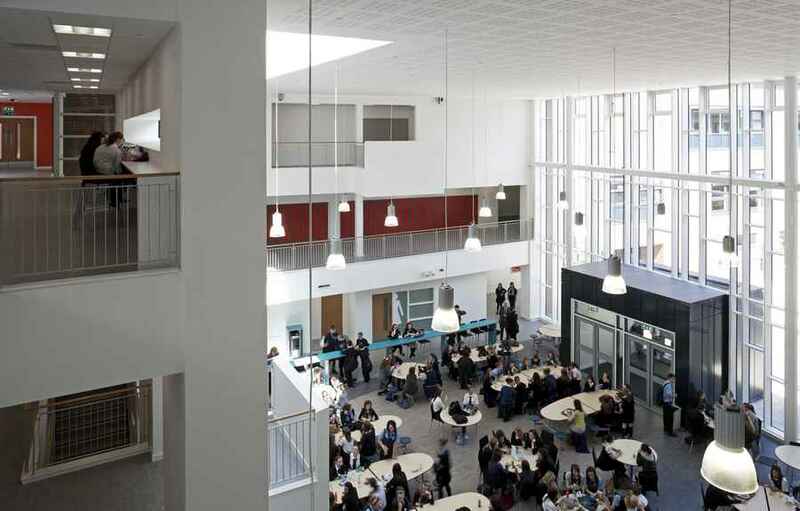 Through its rich variety of spaces and experience, the building offers an environment capable not just of stimulating the educational attainment of its pupils, but also their on-going social development by creating a non institutional, convivial and rewarding environment in which to grow. 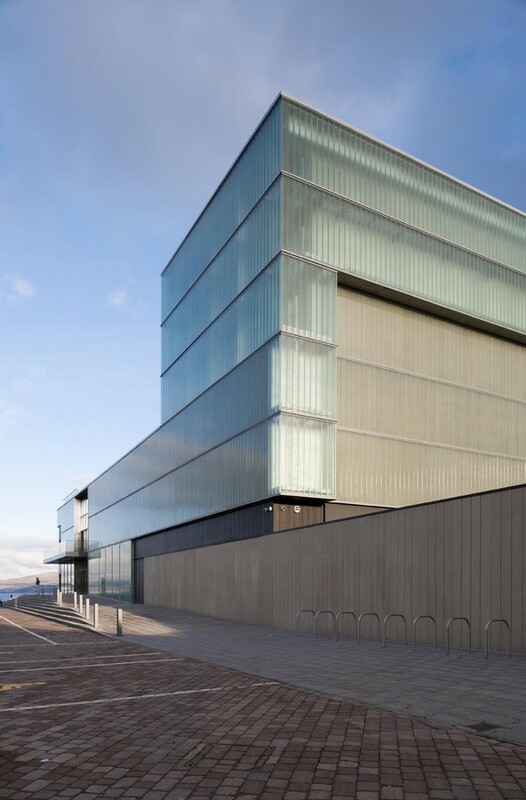 From an external perspective, the new school seeks to provide the town of Greenock with a striking new civic presence, one which is appropriately dignified and responsive to it context, creating a powerful and appropriate visual expression for what is one of the most important buildings in the community. 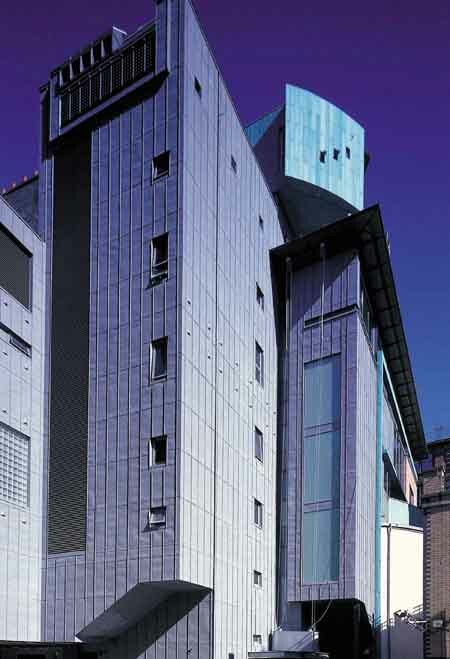 In a typically Scottish manner, a strict and limited palette of materials has been utilised as a contrast to the variety and richness of the building’s form. 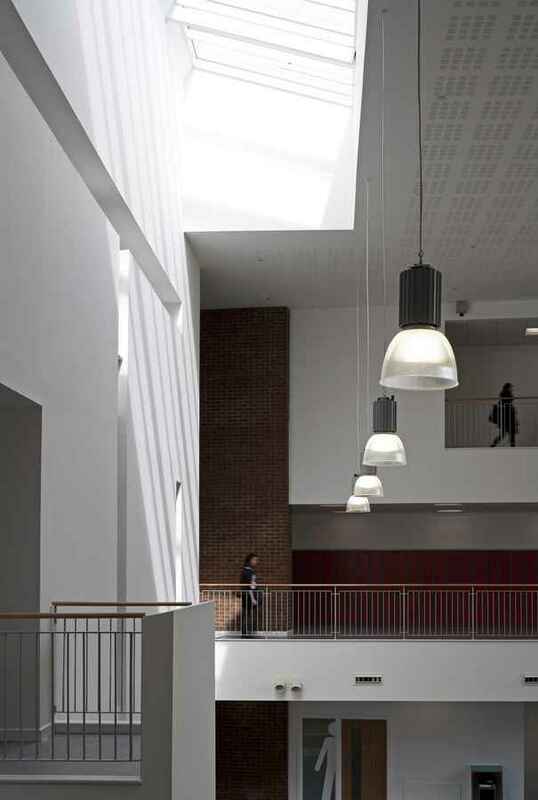 Rich red brick, crisp white render, charcoal gray metal windows, doors and brise soliel, and an exposed concrete colonnade, together with the selected use of traditionally applied zinc cladding contributes to the new school’s consistent visual expression. Notre Dame has been designed with the highest levels of environmental performance firmly in mind. 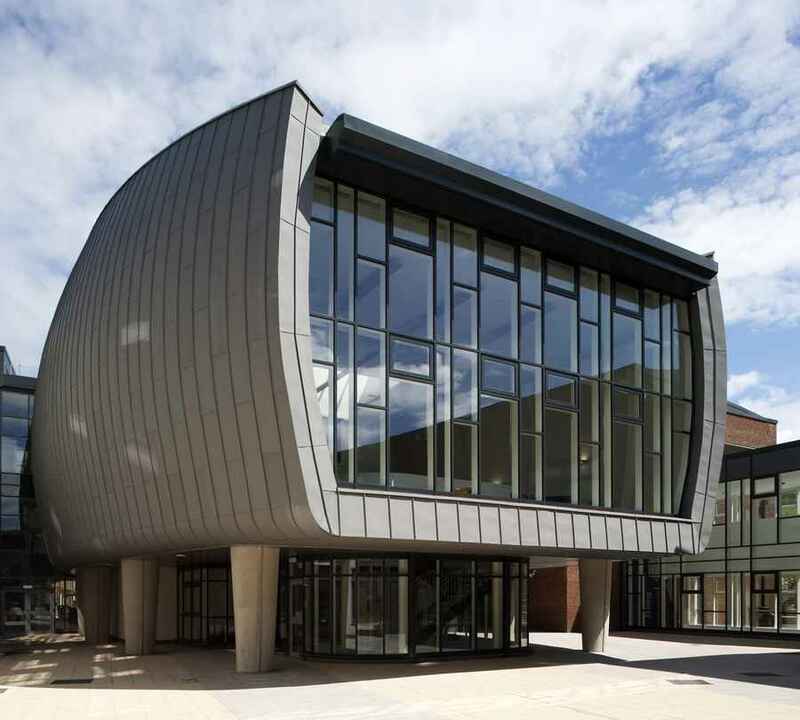 Imbued with high levels of natural light and served by carefully considered natural ventilation systems, the building has been constructed to high levels of air tightness with a fabric capable of achieving excellent standards of thermal performance. The building has been constructed using a post tensioned concrete frame which, together with masonry partitions, provides a high thermal mass that helps to regulate temperature peaks and reduce the risk of summertime overheating. 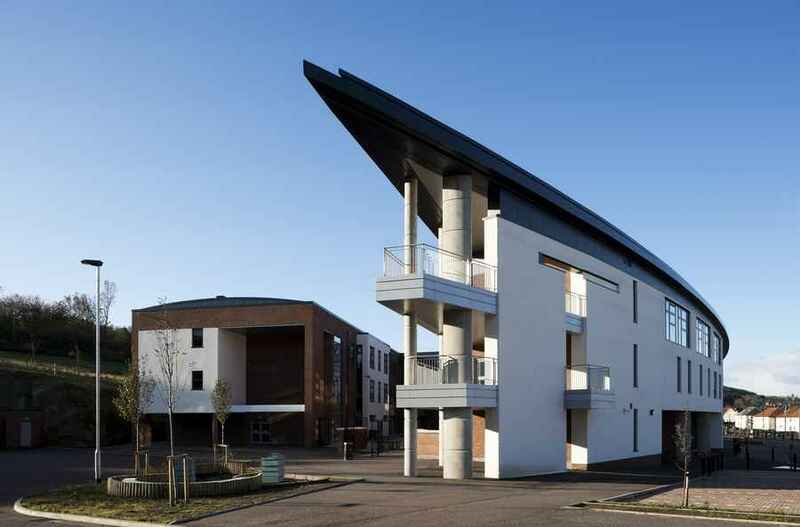 Night purging of the frame is achieved using motorised, glazed-in Renson vents on the external walls of classrooms; cold air is drawn across the exposed concrete soffits, before being discharged via fan assisted stacks located at the back of each space. Solar shading and anti-sun glazing has been provided on appropriate elevations in order to restrict unwanted solar gains and this, together with a very efficient natural ventilation strategy, results in a building that requires only a very minimal amount of mechanical cooling. All materials used in the building have been selected based on “whole life” performance and cost and only materials with the highest possible “green guide” rating were selected in each instance. The M&E services installation has been designed to achieve maximum energy efficiency and longevity and natural ventilation has been used in lieu of mechanical ventilation wherever possible. Where mechanical ventilation has been used, the system incorporates a heat recovery system- thereby minimising the loss of valuable heat in the winter months. 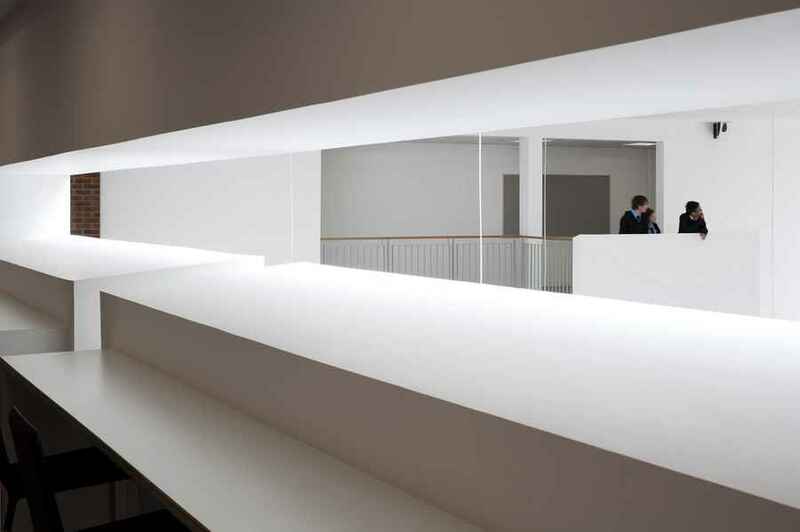 The building has also been provided with a highly intelligent lighting control system in order to extract maximum benefit from the high levels of uniform natural daylight provided throughout its interior. Whilst the primary heat source for the building is a highly efficient natural gas boiler, the building has been designed to make provision for a future biomass boiler. The extent of modifications required in order to install the biomass boiler will be minimal. An array of photovoltaic panels have been provided on south facing roofs and the electricity collected is fed into the school supply, with provision to feed any excess electricity back to the national grid. The quantity of electricity being generated, together with a host of other environmental data, is recorded and available to be viewed by the School Community as an educational resource via an interactive web site run by Inverclyde Council. 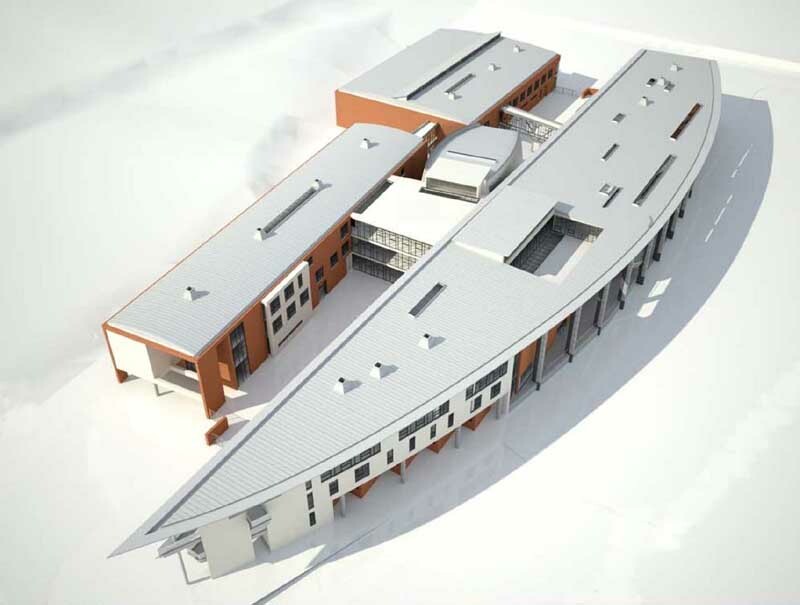 SMC Parr Architects have been named as Preferred Bidder for the £80m Inverclyde Schools PPP project as part of the successful e4i Consortium. 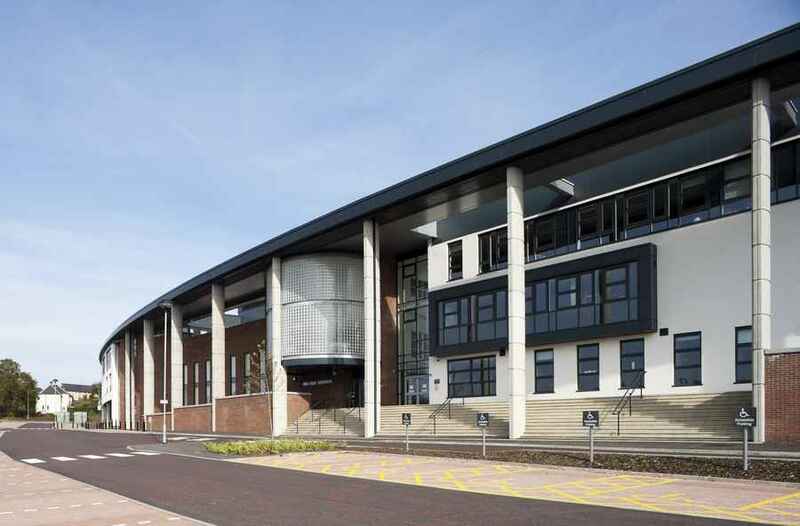 The project consists of four new school buildings – two secondaries and two primaries, some of which incorporate special needs facilities – on a variety of interesting and challenging sites in Greenock.